Bryton Rider 310 Review – Budget GPS Bike Computer! For cyclists, a bike computer not only tracks your route, but compiles ride data to help you train and improve. Unfortunately, a basic Garmin costs upwards of a hundred bucks – even more if it performs anything beyond rudimentary tasks. For the budget-conscious layperson, it can be hard to justify that expense for an activity that is supposed to be, you know, free. A company called Bryton offers much less expensive GPS bike computers than the big-name competition. But are they any good? 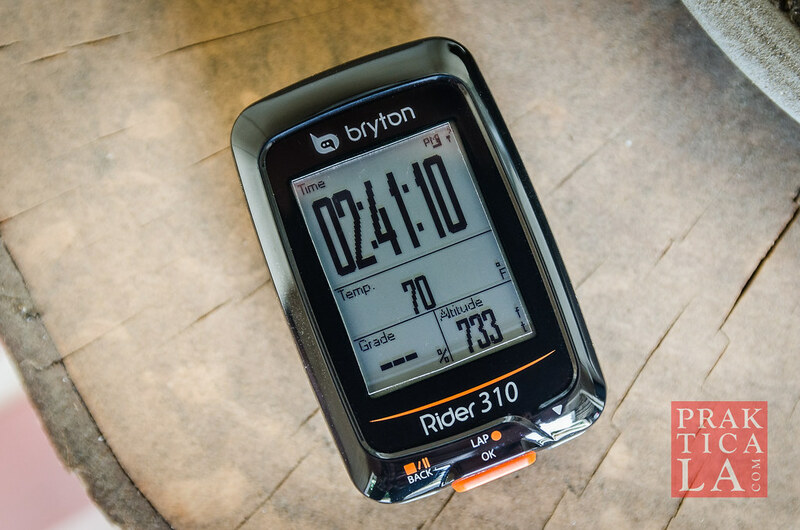 Check out our Bryton Rider 310 review below! Bryton has several GPS computers ranging in price from under $50 to over $200 – still much more affordable than similar devices from Garmin, Wahoo, Polar, etc. The Rider 310 does just about everything short of turn-by-turn navigation and is still under $100. 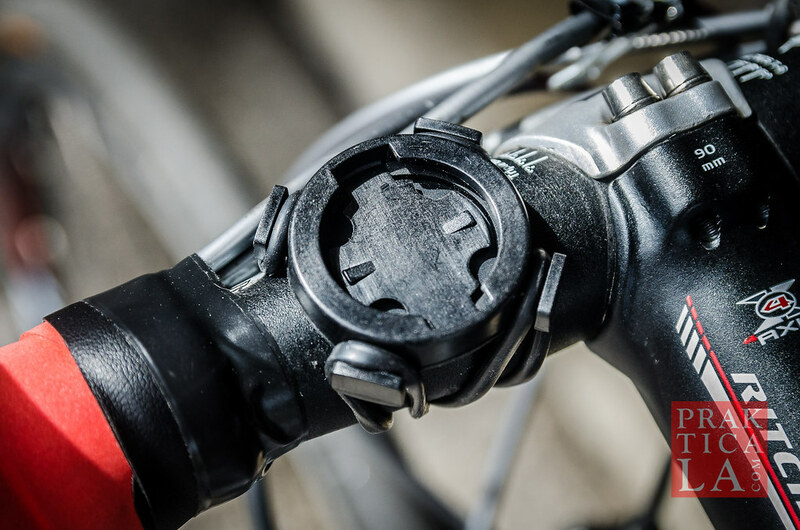 The package comes with a USB charger and a rubber band mount, with several sized bands to fit any handlebar or stem. I would have preferred an “out-front” mount, but the rubber band type is admittedly more versatile. You can always get an out-front mount from Bryton if you want. A note on the mount: the quarter-turn “click” mount looks very similar to a Garmin mount but is in fact not the same. I tested this myself, and the Rider 310 managed to squeeze into a Garmin mount, but did not “click” into place. 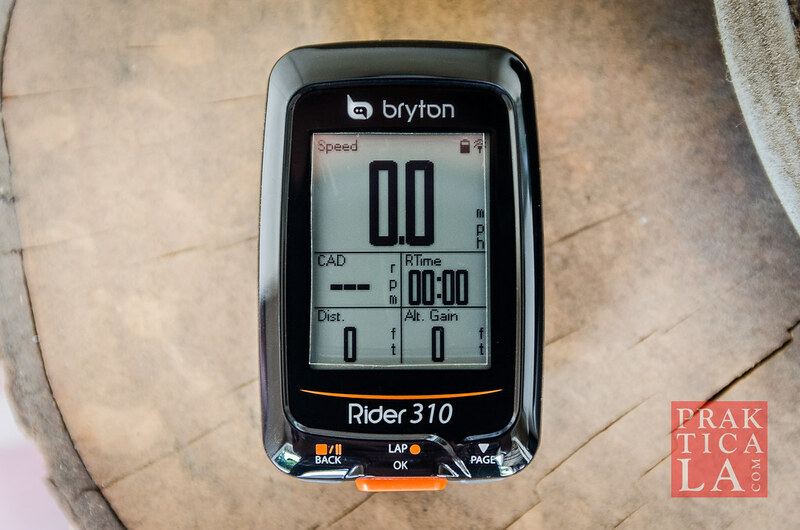 The Bryton Rider 310 has just three buttons – BACK, OK, and PAGE. In menu navigation, OK and BACK do pretty much what you expect, while the PAGE button simply scrolls down (one direction only). Once you start recording a ride, operation is largely automatic. The main screen shows relevant data like distance, elevation, and ride time. Press PAGE to cycle through additional screens for even more data. Each page can display up to eight different metrics, which you can customize in the menu. There are 70 (!) metrics to choose from – temperature, altitude (built-in barometer), sunset/sunrise times, and tons more. You could spend your whole life micro-analyzing all the metrics and data if you wanted. If that’s too overwhelming, you can set it to “auto” and let the computer choose the metrics for you. The Rider 310 acquires a signal outside in just a few seconds. Route tracking appears to be accurate when referenced against Garmin and phone GPS units, although I did notice altitude gain tended to trend slightly lower, between 0-10%. 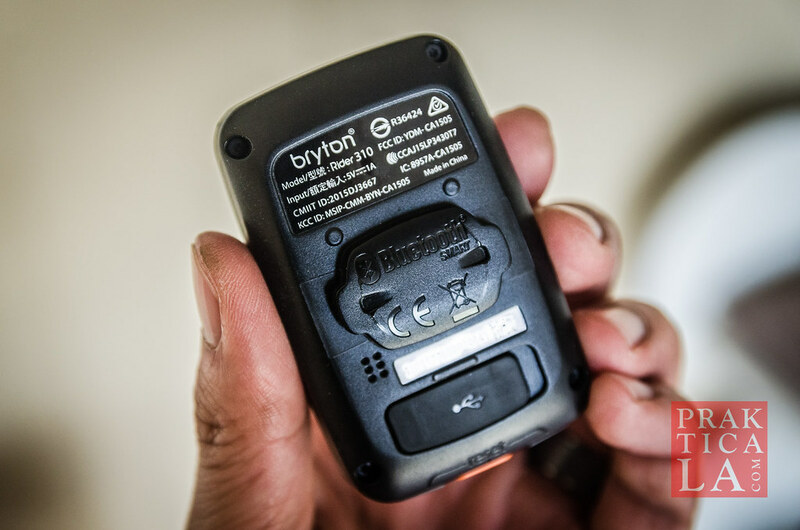 Bryton claims the Rider 310 can get you 36 hours of operation on a single charge. I counted 11 separate rides totaling over 22 hours of ride time before I received a “low battery” notification, so I expect it had another couple hours of juice. I was also Bluetooth syncing after every ride, and used the “1 second” GPS recording setting rather than “smart record,” which I assume means it was pinging the satellites every second rather than “intelligently” to save battery. In other words, I was hammering the battery. So I think the 36 hour claim is actually quite possible. Bryton makes its own ANT+ compatible sensors, but the Rider 310 can be paired with any sensor (cadence, speed, power, heart rate, etc) with ANT+ connectivity. I paired a Garmin cadence sensor without a hitch. Conveniently, the main screen updates itself to display metrics based on any devices paired! In this case, the cadence metric was added to the main screen automatically. Neat. Setting up Bluetooth is simple as well. Once you’ve paired it to your phone, you can use the Bryton app to sync your ride data. You can also set the app to automatically upload your ride data to Strava so you can share your activities with friends. I’ve read a few complaints online about Strava connectivity issues, but so far it has worked flawlessly. Note: many websites (including the manufacturer’s) claim the Rider 310 receives notifications (call, text, email) via Bluetooth. However, it does NOT do this (which I confirmed with Bryton support). Perhaps it was originally capable of this feature until was removed. A Bryton “toggle” switch even appeared in my phone’s notification settings menu, which appears to have no effect. The free Bryton app looks and feels dated, but it gets the job done. It basically displays your account on the Bryton Active website, but in mobile format. All the data you could possibly need is housed there and is easy to read. The more ANT+ devices you’ve paired to the Rider 310, the more data it will compile. PROS: Fully featured for significantly less money. Operates smoothly and without issue. Large display, yet lightweight. Excellent battery life. The Bryton Rider 310 tracks your ride accurately and collects as much data as you want, without you ever having to cross the dreaded $100 threshold. If you’re budget-conscious, that should be all you need to know! You can get the Bryton Rider 310 on Amazon here. Do you like your Bryton bike computer? Let us know in the comments! Previous PostOwen Edward Oxford Dress Shoe ReviewNext PostPoseidon Triton Review – Updated Road Bike!